DIE Mercurii, 19 die Decembris. Message from H. C. with Bills; and to return Ly. Eliz. Noel's. Bill for taking Accompts of Public Monies. House to petition the King to issue a Commission for taking Public Accompts. Quarrel between the D. of Bucks and the Marq. of Dorchester. Both committed to The Tower. Epus. Carlile. Edwardus Comes Clarendon, Ds. Cancellarius Angl. 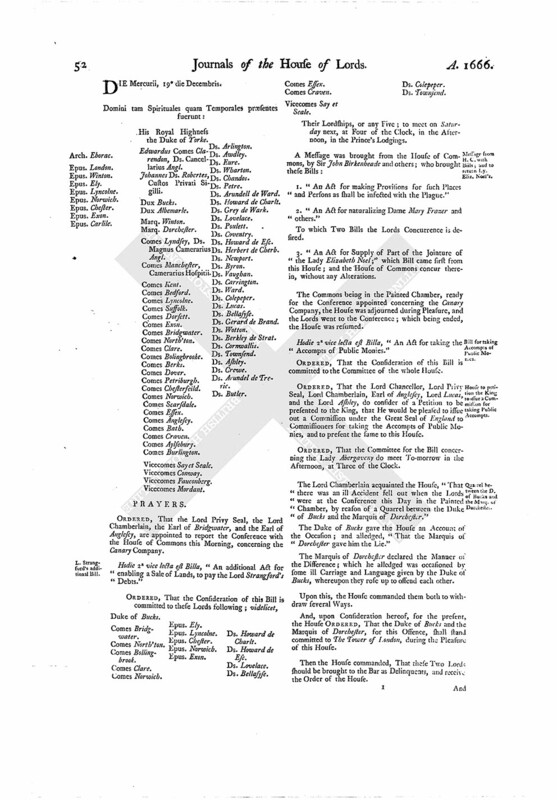 ORDERED, That the Lord Privy Seal, the Lord Chamberlain, the Earl of Bridgwater, and the Earl of Anglesey, are appointed to report the Conference with the House of Commons this Morning, concerning the Canary Company. Hodie 2a vice lecta est Billa, "An additional Act for enabling a Sale of Lands, to pay the Lord Strangford's Debts." Vicecomes Say et Seale. Epus. Ely. Epus. Exon. Ds. Howard de Charlt. Their Lordships, or any Five; to meet on Saturday next, at Four of the Clock, in the Afternoon, in the Prince's Lodgings. 1. "An Act for making Provisions for such Places and Persons as shall be infected with the Plague." 2. "An Act for naturalizing Dame Mary Frazer and others." To which Two Bills the Lords Concurrence is desired. 3. "An Act for Supply of Part of the Jointure of the Lady Elizabeth Noel;" which Bill came first from this House; and the House of Commons concur therein, without any Alterations. The Commons being in the Painted Chamber, ready for the Conference appointed concerning the Canary Company, the House was adjourned during Pleasure, and the Lords went to the Conference; which being ended, the House was resumed. Hodie 2a vice lecta est Billa, "An Act for taking the Accompts of Public Monies." ORDERED, That the Consideration of this Bill is committed to the Committee of the whole House. ORDERED, That the Lord Chancellor, Lord Privy Seal, Lord Chamberlain, Earl of Anglesey, Lord Lucas, and the Lord Ashley, do consider of a Petition to be presented to the King, that He would be pleased to issue out a Commission under the Great Seal of England to Commissioners for taking the Accompts of Public Monies, and to present the same to this House. ORDERED, That the Committee for the Bill concerning the Lady Abergaveny do meet To-morrow in the Afternoon, at Three of the Clock. The Lord Chamberlain acquainted the House, "That there was an ill Accident fell out when the Lords were at the Conference this Day in the Painted Chamber, by reason of a Quarrel between the Duke of Bucks and the Marquis of Dorchester." The Duke of Bucks gave the House an Account of the Occasion; and alledged, "That the Marquis of Dorchester gave him the Lie." The Marquis of Dorchester declared the Manner of the Difference; which he alledged was occasioned by some ill Carriage and Language given by the Duke of Bucks, whereupon they rose up to offend each other. Upon this, the House commanded them both to withdraw several Ways. And, upon Consideration hereof, for the present, the House ORDERED, That the Duke of Bucks and the Marquis of Dorchester, for this Offence, shall stand committed to The Tower of London, during the Pleasure of this House. Then the House commanded, That these Two Lords should be brought to the Bar as Delinquents, and receive the Order of the House. And first the Duke of Bucks was brought; who having kneeled, the Lord Chancellor, in the Name of the House, told him, "That his Offence was of so high a Nature, that this House hath taken little Time to consider of it, being a great Offence to the King Himself, and an Affront to this House, bringing a Reproach upon their Lordships in the Face of the Kingdom; for which this House hath ordered him to stand committed to The Tower of London, during the Pleasure of this House." The Marquis of Dorchester was likewise brought to the Bar; who having kneeled, the Lord Chancellor, in the Name of the House, told him, "That his Offence was of so high a Nature, that this House hath taken little Time to consider of it, being a great Offence to the King Himself, and an Affront to this House, bringing a Reproach upon their Lordships in the Face of the Kingdom; for which this House hath ordered him to stand committed to The Tower of London during the Pleasure of this House." ORDERED, That the Lieutenant of The Tower of London, or his Deputy, shall receive the Body of George Duke of Bucks, and keep him in safe Custody in the said Tower of London, until the Pleasure of this House be further signified (for his great Offence against His Majesty and this House, in quarreling and proceeding therein to ill Language with the Marquis of Dorchester; in the Painted Chamber, during a Conference between the Committees of both House:) And this shall be a sufficient Warrant in that Behalf. 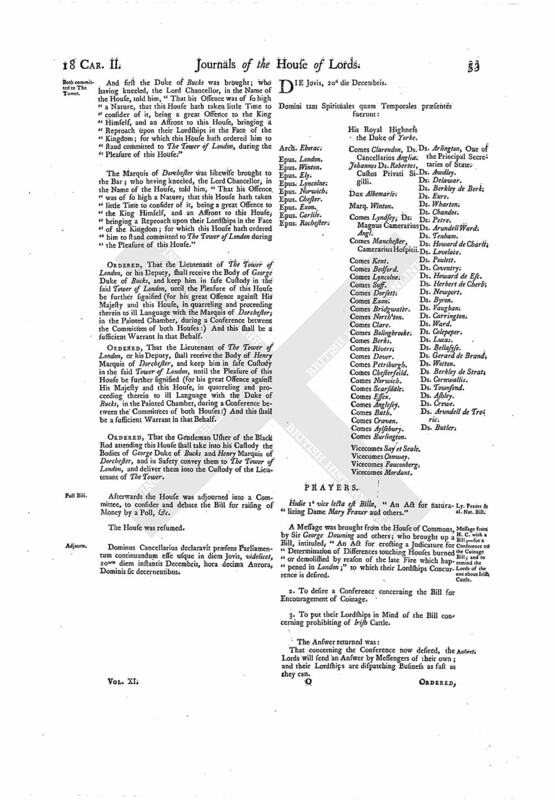 ORDERED, That the Lieutenant of The Tower of London, or his Deputy, shall receive the Body of Henry Marquis of Dorchester, and keep him in safe Custody in the said Tower of London, until the Pleasure of this House be further signified (for his great Offence against His Majesty and this House, in quarreling and proceeding therein to ill Language with the Duke of Bucks, in the Painted Chamber, during a Conference between the Committees of both Houses:) And this shall be a sufficient Warrant in that Behalf. ORDERED, That the Gentleman Usher of the Black Rod attending this House shall take into his Custody the Bodies of George Duke of Bucks and Henry Marquis of Dorchester, and in Safety convey them to The Tower of London, and deliver them into the Custody of the Lieutenant of The Tower. Afterwards the House was adjourned into a Committee, to consider and debate the Bill for raising of Money by a Poll, &c.
Dominus Cancellarius declaravit præsens Parliamentum continuandum esse usque in diem Jovis, videlicet, 20um diem instantis Decembris, hora decima Aurora, Dominis sic decernentibus.